In this nice VIS image, taken by the NASA - Mars Odyssey Orbiter on October, 25h, 2015, and during its 61.495th orbit around the Red Planet, we can see a small part of the of Complex Channels' System known as Athabasca Valles. The relatively small Channel visible here has partially eroded some of the Ejecta exisiting all around the Unnamed Impact Crater (with Pedestal) that is located in the upper right (Dx) part of the frame. Athabasca Valles is a (relatively) young Outflow Channels' System that might have been carved by Catastrophic Water Floods. However, a few images acquired by the High-Resolution Imaging Science Experiment Camera located onboard the NASA - Mars Reconnaissance Orbiter Spacecraft, revealed that Athabasca Valles is now entirely draped by a thin Layer of Solidified Lava � such as the remnant of a (once) swollen River of Molten Rocks. The Lava (most likely) erupted from a Fissure, then inundated the Channels, and Drained downstream in Geologically recent times. Purported Ice Features in Athabasca Valles and its Distal Basin, Cerberus Palus, are actually composed of this Lava. Similar Volcanic Processes may also have operated in other Fluvial Channels - in origin -, and this circumstance could explain, at least in part (but, as a matter of fact, this is just a theory), the reason why the Landers which havee been sent to investigate Sites of ancient Flooding that occurred on Mars eons ago, have predominantly found Lava on the Surface, instead of Ice. 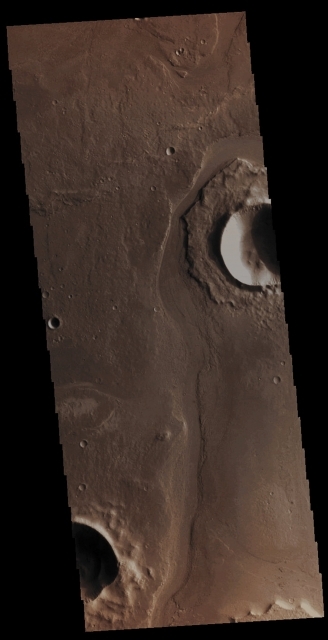 This image (which is an Original Mars Odyssey Orbiter b/w and Map-Projected frame published on the NASA - Planetary Photojournal with the ID n. PIA 20217) has been additionally processed, magnified to aid the visibility of the details, extra-contrast enhanced and sharpened, Gamma corrected and then colorized in Absolute Natural Colors (such as the colors that a normal human eye would actually perceive if someone were onboard the NASA - Mars Odyssey Orbiter and then looked down, towards the Surface of Mars), by using an original technique created - and, in time, dramatically improved - by the Lunar Explorer Italia Team.